Vancouver is the country's priciest rental market. 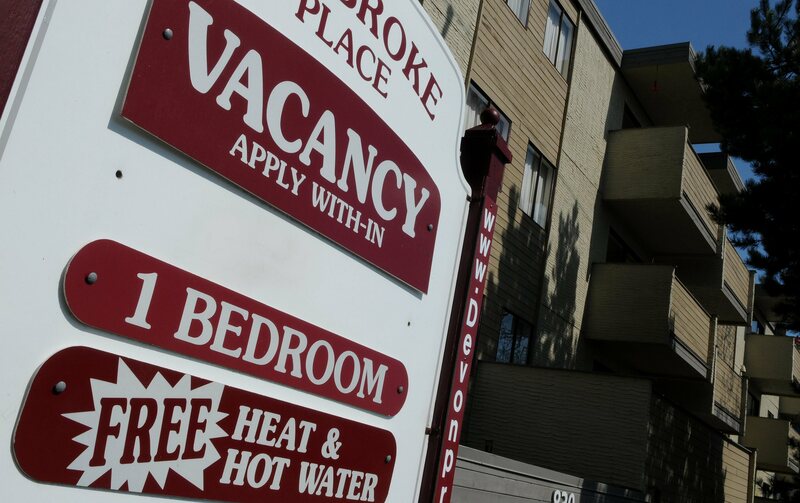 Rental rates fell in May in many Canadian cities, according to a newly-launched survey, but that doesn’t mean renting a place to live is suddenly super-cheap. A two-bedroom apartment in Vancouver rents for $1,000 more than a similar place in Toronto, according to rental site Padmapper — $2,780 a month, compared to $1,650 in Toronto, the second-most expensive city on the list. 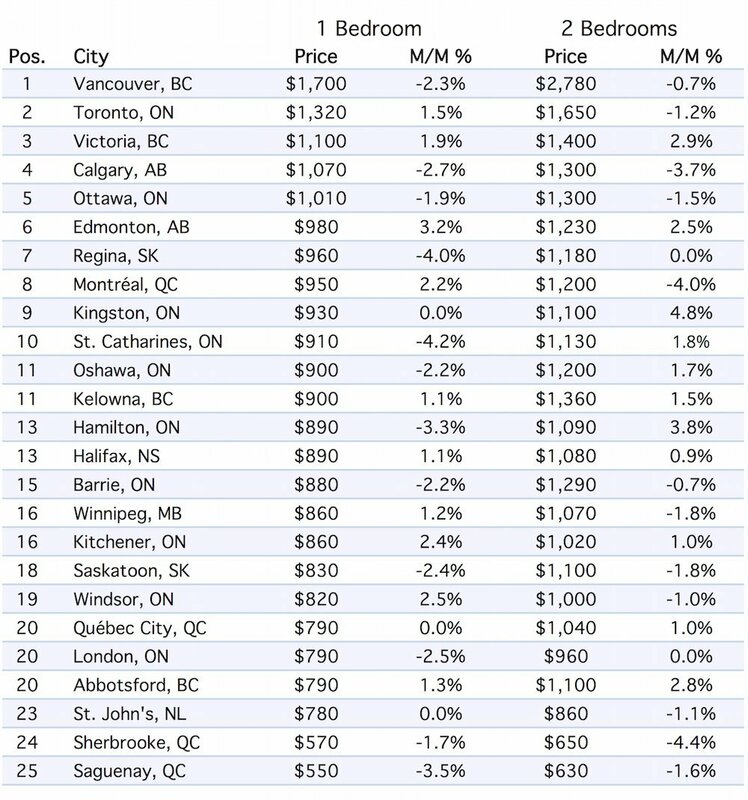 The site used data from thousands of listings to determine the median price of apartments across 25 metro areas across Canada, and Vancouver topped the list of priciest rentals. If you’re a Vancouverite looking to upgrade to a two-bedroom place from a one-bedroom place, you’re going to need an extra $1,080 a month ($2,780 for two bedrooms versus $1,700 for one). That difference is basically twice what it costs to rent an entire apartment in Saguenay, Que., the least expensive city on the list, where one bedroom will run you a mere $550, and you can get two bedrooms for $80 more. 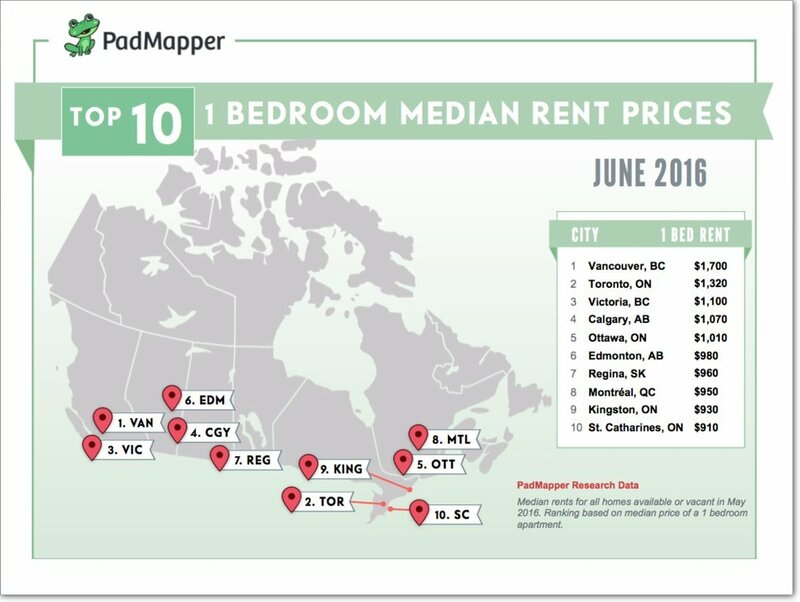 The Padmapper survey showed that rental rates fell in some of Canada’s hottest rental markets in June from May, with Vancouver registering a 2.3-per-cent decline in rental rates and two-bedroom rates falling 0.7 per cent. In Toronto, two-bedroom places were down 1.2 per cent but one-bedroom apartments were up 1.5 per cent. But one-month changes in prices are very volatile, and Padmapper’s recently-launched survey doesn’t have older data to compare prices today with a year ago. Still, numbers from other (not perfectly comparable) surveys suggest rental rates have risen over the past year. A Rentseeker survey carried out last fall found it cost an average of $1,368 to rent a two-bedroom apartment in Vancouver at that time, while in Toronto it cost $1,288. Market observers say rapidly rising prices in Toronto and Vancouver are putting upward pressure on rental prices, especially rental condos. “We noticed condo prices began to accelerate in the second half of ,” Urbanation vice-president Shaun Hilderand said of Toronto recently. Borough expensive is to live in cities like Toronto and Vancouver what which city-state the real-estate take it you're looking to brad Brits sneaker. Dot C. Yeah a german unit which ron ablaze website. We fitch annual info-graphics for cheapest and placing his city's to rent in february too few people surprises metropolis is like to ravel Vancouver and powdery that lead three cities racked up rates of will grow up $100 for one that part. Of the other end of the straw actor um. We're cities like cats an old montreal of windsor. The tendency can expect the rented covering the bid 600 bryn seekers research depends on statistics contained in the town of the mortgage and housing corporations 2014 before. More stories on canadian real-estate check back in the huffington post out of a business.